Low Carb Hot Chocolate - The BEST Sugar Free Drink to Cozy Up With! What is it about the winter months that automatically gets us craving comfort foods – especially a big ole mug of low carb hot chocolate. Yum! 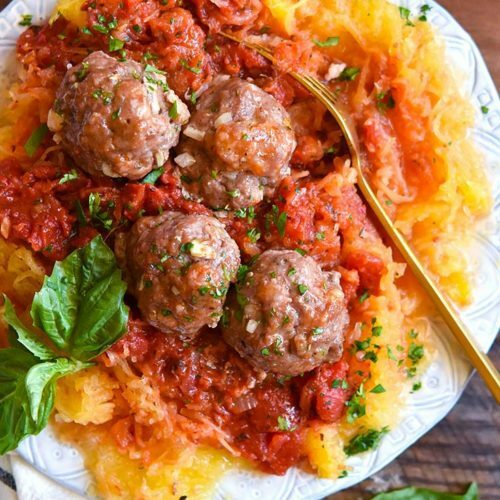 …just because you’re losing all that sugar and some nasty carbs doesn’t mean you have to lose the flavor – or any of your winter cheer for that matter! 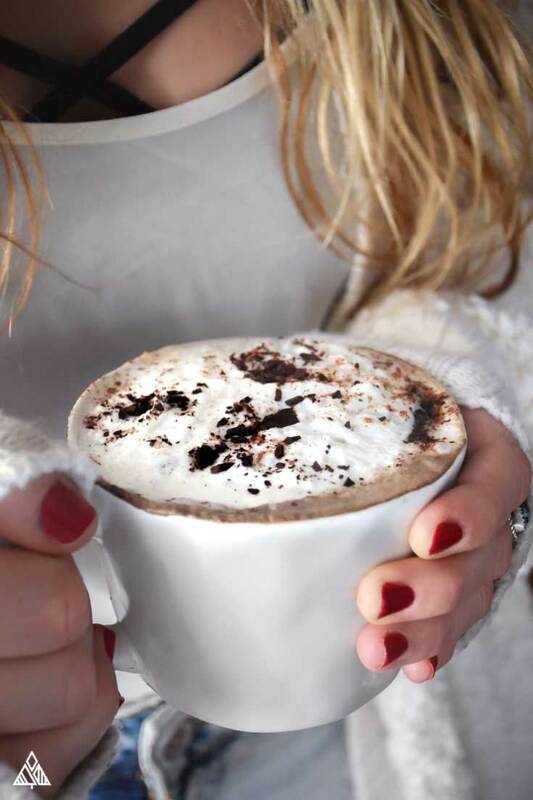 And this low carb hot chocolate recipe will satisfy all your cold day cravings! Low carb hot chocolate is the perfect cold weather beverage. Keep it a G rated low carb drink with a variety of milk alternative, or add some low carb alcohol for a little something extra! …which explains why those powdered, processed and not-so low carb hot chocolate packets are concentrated sugar bombs without the health benefits. Drinking cacao has been shown to reduce blood pressure, improve blood vessel health, lower bad cholesterol and raise good cholesterol. When scientists looked at the health of indigenous populations who regularly drink cacao they found that these populations, like the Kuna Islanders, have a lower incident of heart disease, diabetes, and cancer. That said, the nutritional benefits of cacao and cocoa are different – which stems from the way they’re processed. I know what you’re thinking, you aren’t necessarily making a cup of low carb hot chocolate with antioxidants in mind – which I totally get – use whichever ingredient you have at your disposal, as they’ll both work for this recipe. I always use cacao, because, why not? Up to you! 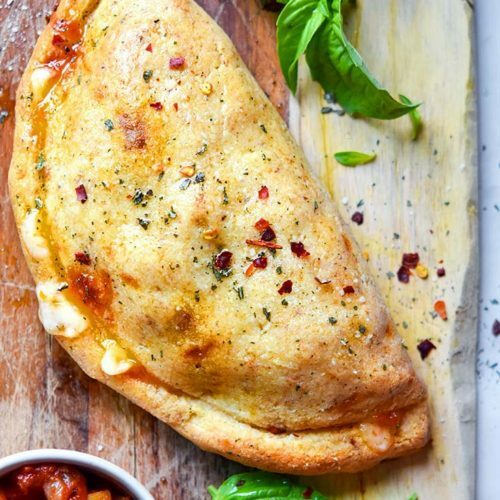 Delicious, indulgent, and heart healthy? Where is my mug? Since Cacao, is technically, a bean, low carbers might be hesitant to indulge because carbs in beans are notoriously high – however, we use very little cacao powder in this low carb hot chocolate recipe. In general, the issue with hot chocolate is the simple carbs due to intense amounts of added sugar and use of dairy milk. 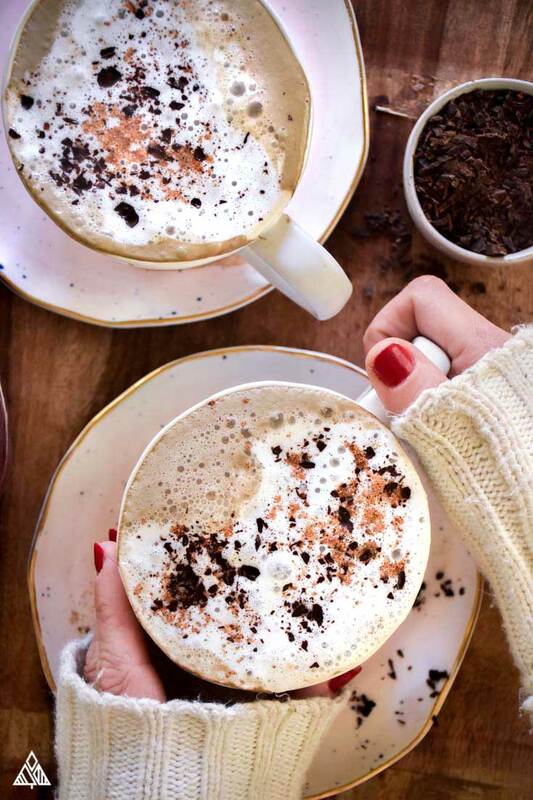 What makes this low carb hot chocolate recipe so different? Small changes, like skipping those sugar foods and using a low carb milk – you’ll hardly taste the difference. All of us following the low carb food list know to avoid sugar. But cow’s milk is an often-overlooked ingredient. Believe it or not, it’s one of the major examples of carbohydrates. The answer is to pick a low carb milk alternative. We have a whole chart/article about this if you’re interested. If not, I find with low carb hot chocolate coconut milk is a clear winner. 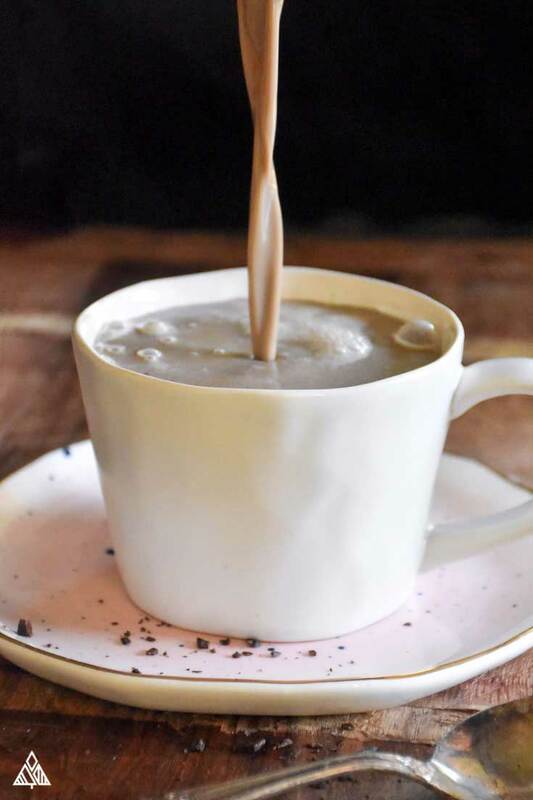 If that isn’t your thing, almond, hemp, and cashew milk all make for keto hot chocolate dairy free! 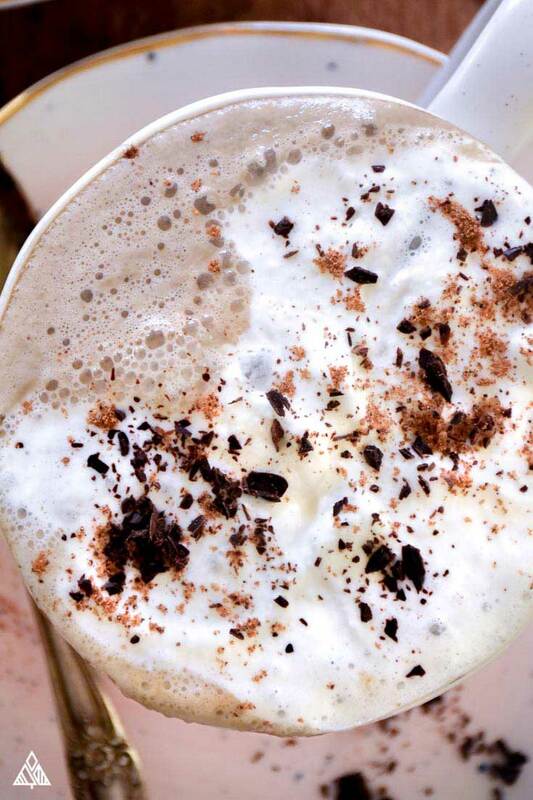 Many low carb hot chocolate recipes use heavy cream instead of a milk alternative. This is way too rich for me, but if it’s your thing give it a try! You can also try half heavy cream, half low carb milk alternative. PS… heavy cream has 0 grams of carbohydrates per ¼ cup… but it does have loads of fat. 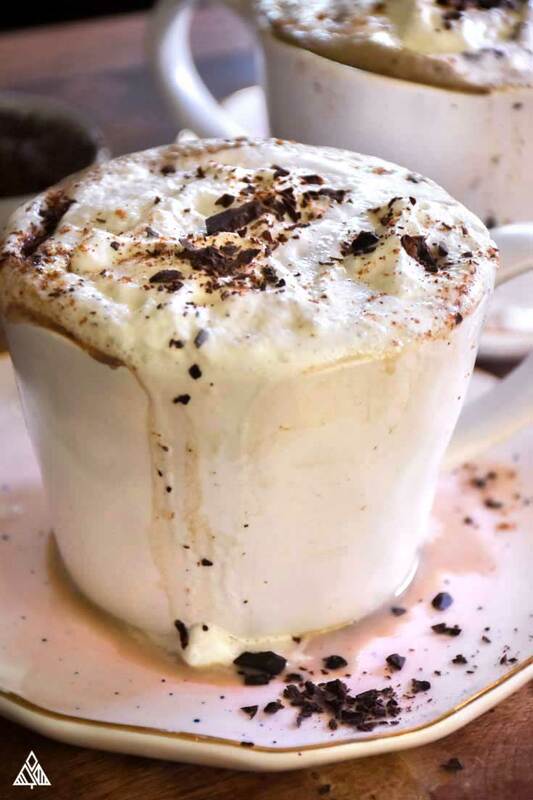 This recipe is so straight forward, and takes hardly any time to make — but on those hectic mornings or lazy days when you just need a quick fix of something sweet, you might not want to make a batch over the stove, and unfortunately the low carb hot chocolate starbucks sells is not so low in carb. Great news for us low carbers, there are a few options! #1 during your weekly meal prep, or a weeknight where you have a little extra time, simply add the dry ingredients to a plastic bag for your very own keto hot chocolate mix recipe. When you’re jonesing for your low carb hot chocolate, add it to a cup of low carb milk, stir and microwave till it’s warm enough to enjoy! #2 You can buy low carb hot chocolate k cups! Each cup has 5 grams of carbs, which may be more than some of you would like to sip on, however it’s about the same as any homemade low carb hot chocolate! Because I know you were wondering… yes there’s a myriad of low carb Starbucks drinks, but unfortunately there’s no keto hot chocolate Starbucks currently carries. 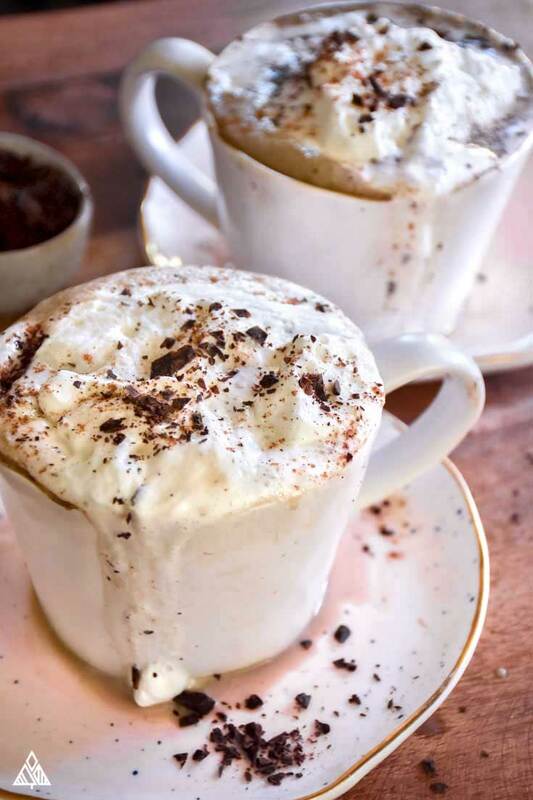 This keto hot chocolate recipe calls for a pinch of sea salt and a smidge of vanilla… plus a swirl of sugar free whipped cream, because we all know everything tastes better topping in whipped cream! You can easily make this a Mexican hot chocolate by adding in a pinch of cayenne pepper and a heavier emphasis on cinnamon and nutmeg. Depending on your low carb meal plan, you could also mash a few raspberries at the bottom. Add a tablespoon of nut butter. Top with toasted coconut flakes. YUM! If you’re looking for other ways to spice up your cup, check out our healthy hot chocolate graphic. Mind you, these aren’t all low carb recipes, so adjust and skip where needed. 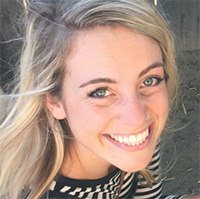 If you’re doing the low carb for life thing (like me, high five!) I’ve found it easiest to make it your lifestyle, instead of allowing it to feel like constant deprivation. For example, simple sugar, grains, and other high carb foods I simply don’t eat anymore, and I’ve become (most of the time) ok with that! Yes, most of my diet consists of low carb vegetables, low carb fruits and lean proteins – but like everyone else out there, I crave the foods I’m not “supposed to eat” the most. 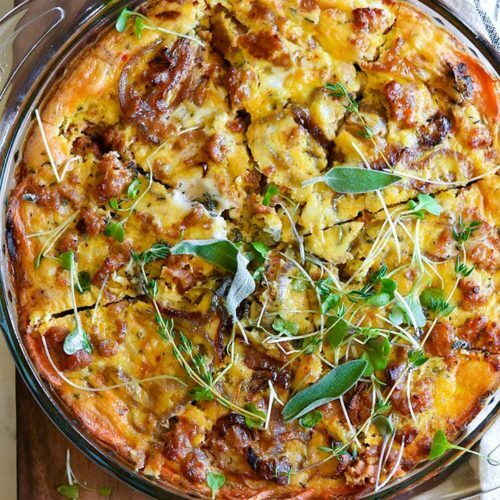 So, with a little ingenuity, I’ve transformed some of my favorites into low carb recipes – low carb desserts, low carb cocktails, low carb snacks, you name it! 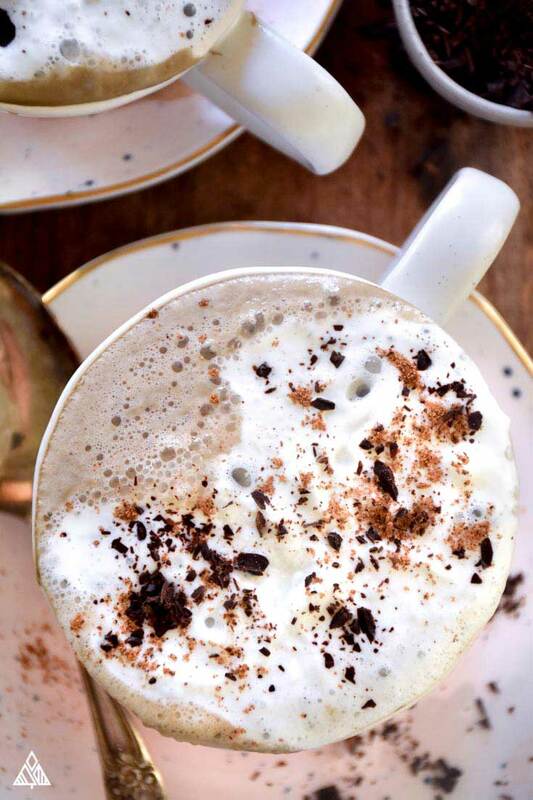 So, enjoy getting creative in the kitchen, and ENJOY this low carb hot chocolate recipe Atkins would approve of! 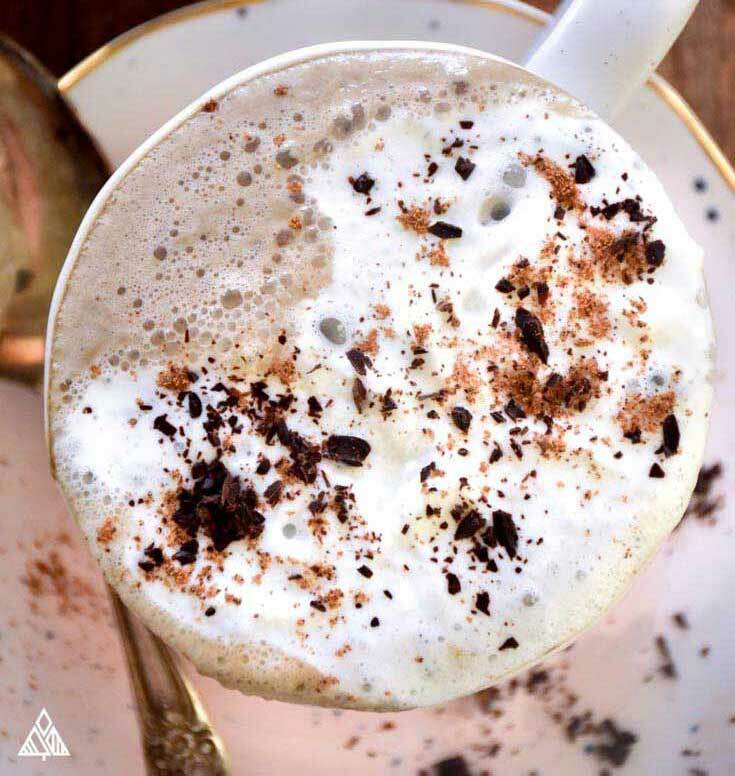 I hope you love this low carb hot chocolate recipe as much as I do! Let me know what variations you try… high protein low carb hot chocolate, keto bulletproof hot chocolate, mint, I want to hear about it! Toss all ingredients (except whipped cream and dark chocolate shavings if using) into a pot on the stove and stir while heating to desired temperature. 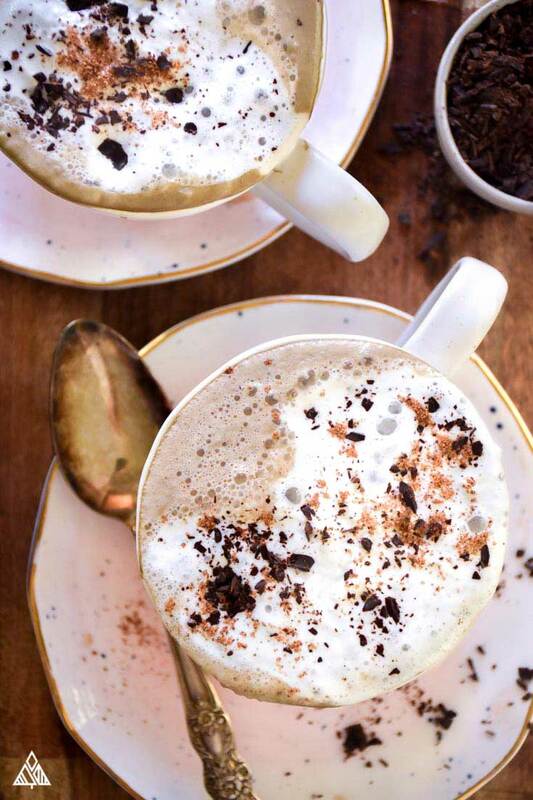 Pour into 2 mugs, top with whipped cream, dark chocolate shavings and a sprinkle of cinnamon and nutmeg. Enjoy! *I used almond milk for the nutritional information. Optional toppings are not included in nutritional information. Thanks Kathleen! Hope you enjoy!